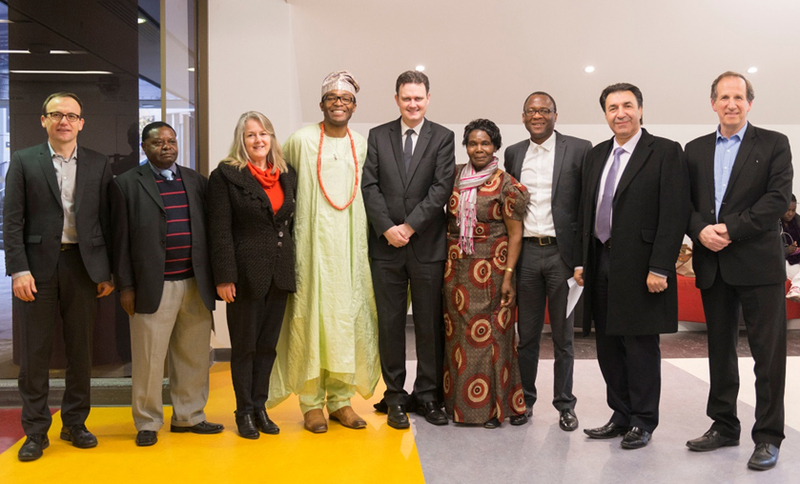 FFWPU Australia, 18-23 May, 2015, Family and Youth Forum: African Australian Leadership and others representing the fields of culture, social development, law, business, and politics and youth entrepreneurship presented at a day long forum at RMIT University. The speakers inspired all that attended to feel empowered to change their own lives and the lives of others. From left: Adam Bandt federal member for Melbourne, Dr Appollo Nsubuga-Kyobe La Trobe University and Africa Day Australia (ADA) committee member, Anne Bellavance President Women’s Federation for World Peace and ADA committee member, Fred Alale ADA committee member, Hon. Robin Scott MP Minister for Multicultural Affairs Victoria, Theresa Sengaagaa Ssali ADA committee member, Stephen Sibanda President Africa Day Australia, Ross Alatsas Chairperson for the Victorian Multicultural Commission and John Bellavance Vice-President ADA and Universal Peace Federation. This youth talent quest unleashed African Australian creative talents. Africa’s Got Talent is the performing arts competition part of Africa Day. It is open to young emerging African Australian artists to showcase their talent to the wider Australian community. UPF Australia has been actively supporting “Africa Day” and the African community in recent years, notably in Victoria where UPF Australia Vice President, John Bellavance, has initiated and helped run major “Africa Day” events over the last four years. In New South Wales, there have been more modest but no less sincere efforts to date. For the second consecutive year, UPF representatives actively supported the ‘Africa Day’ presence in the annual Blacktown Festival on Saturday 30 May. This included marching with the African communities in the large street parade, and then attending the event hosted by them in commemoration of ‘Africa Day’. The event included speeches by African community elders and leaders, and a representative of the Mayor of Blacktown, as well as dancing, Ethiopian coffee, food and displays. [Blacktown is the largest of any suburb or township in New South Wales and is one of the most multicultural places in Sydney, including with significant emerging African communities].